For stays with friends or family holidays, a cottage rental in Burgundy is often sought. Le Moulin de St Georges, old mill restored by decorator Jacques Dupuis, is a perfect cottage for a group of 5 to 7 people in search of peace and greenery. Le Moulin de St Georges has 4 rooms for a relaxing stay: the charm of the cottage in the heart of Burgundy, lies as much by its beautiful countryside, as the interior decoration of each room. Renting our cottage can be done for 4 bedrooms, spacious and bright, accommodating individual parents and enfants.Chacune room of our cottage has been customized so that our customers feel perfectly fine to, and benefit most of their stay at the Mill to relax. 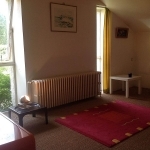 If you are looking for a cottage rental in Burgundy for 5 to 7 people, close to Auxerre, Chablis and Vézelay, Le Moulin de St Georges offer you a warm and conducive to serenity environment. The quiet afforded by this cottage regularly leads to long term rentals for artists, writers or families wishing to temporarily live in our beautiful region. This cottage chamber dominant gray harmony is configured to accommodate 2 single beds that can be pushed together. 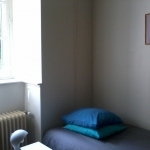 Spacious, beautiful room hosts a double bed 140x190cm, isolated by a partition for absolute calm.